Another relatively new wedding reception venue in Nassau County, Long Island is The North Ritz Club in Syosset, New York. I sat "relatively new" because the building has been here for decades. Formerly home to another catering establishment, the legendary Villa Victor; the premises have undergone an incredible remodeling project and now offers one of the most beautiful wedding celebration places anywhere from NYC out to Suffolk County. The grand entrance to the building is nothing short of a work of art. Elsewhere on this web site you will find photos of this impressive entry. The ballroom is huge and elegantly appointed. The beautiful gardens serve as the perfect backdrop for an outdoor cocktail hour and stunning wedding pictures. 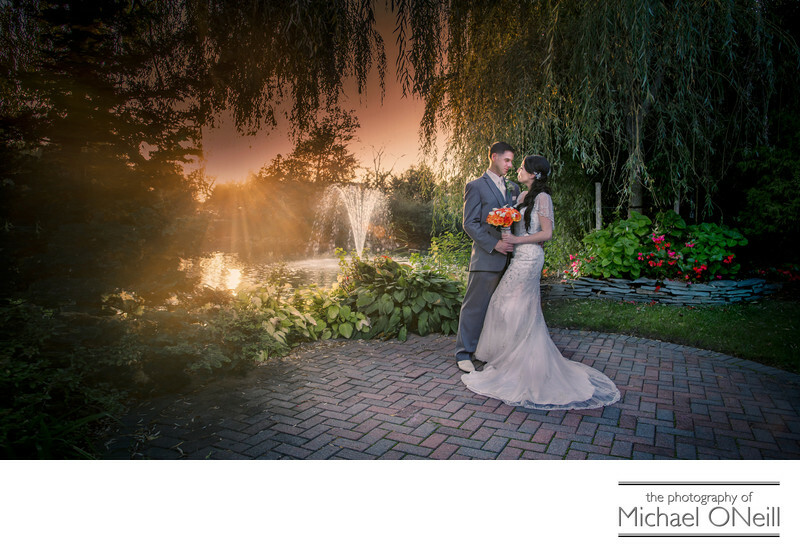 The private pond on the property with it’s integral fountain provided the background for this sunset wedding photograph. Since it’s remodeling and grand re-opening I have had the pleasure of photographing many weddings at The North Ritz Club, including a huge huge multi-day Indian Wedding event. My East Northport, NY wedding photography studio and gallery is located just 15 minutes from the North Ritz Club adding the element of convenience into the mix. If you are planning a North Ritz Club wedding give me a call. I have the experience you are looking for to insure that your wedding photographs are exactly what you want them to be.